Probably one of the most critical phases in the construction of this project, is the installation of the PiTFT screen. A lot of people have asked for previous projects if I could design the project utilizing (insert cheap screen from Amazon) versus using Adafruit's. The reason for my continued use of Adafruit screens is guaranteed reliability and long term support, which is something you cannot say about a lot of those cheaper screens from Amazon, eBay and Aliexpress. Follow the steps on this part very carefully and make sure to take a look at all the pictures when you work on this part. DO. NOT. FORGET. THIS. Otherwise you will have a bad day. 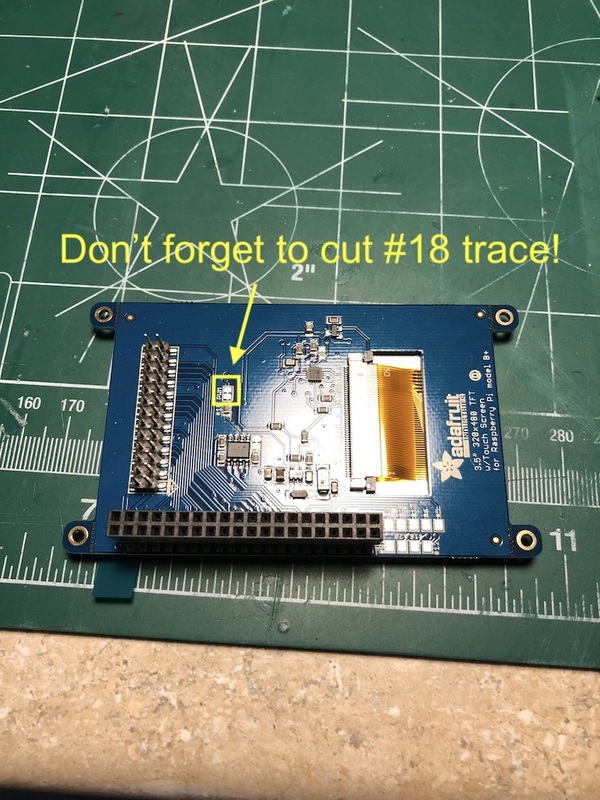 GPIO #18 is actually wired to be used by I2S audio, so if you forget to cut this trace every time your audio outputs, the screen will cut out and go black. The only way to fix it is to basically break your PiTFT off of the PCB, desolder all the pins and restart with a new screen (I know from first hand experience). Use a utility knife or flat head screwdriver to just scrape the small connection between the two pads. You'll first want to clip the female header on the PiTFT, but make sure you don't clip the male header as it's necessary for the build. After you clip the female header, you'll want to work on wiggling the plastic retainer off of the male header. Wiggling off the plastic retainer will be one of the most tedious things you need to do on this build. If you don't do it right, you could snap a pin, so be sure to just go slow and wiggle side to side. Once you get the retainer off, go ahead and insert the screen into the case, and screw it in place. Clip the female header from the PiTFT to allow it to fit in the case. Slip the PiTFT into the case as shown, make sure you test the Start/Select Button afterwards to see if they work properly. There is no going back after this step. You may want to go back over the last few steps and make sure that you didn't miss anything. You'll want to make sure you put in your D-Pad and ABXY Buttons in place first. Make sure that those buttons feel good and have been sanded to have free movement. Once you have this completed, go ahead and press the PCB assembly down through the PiTFT male header. 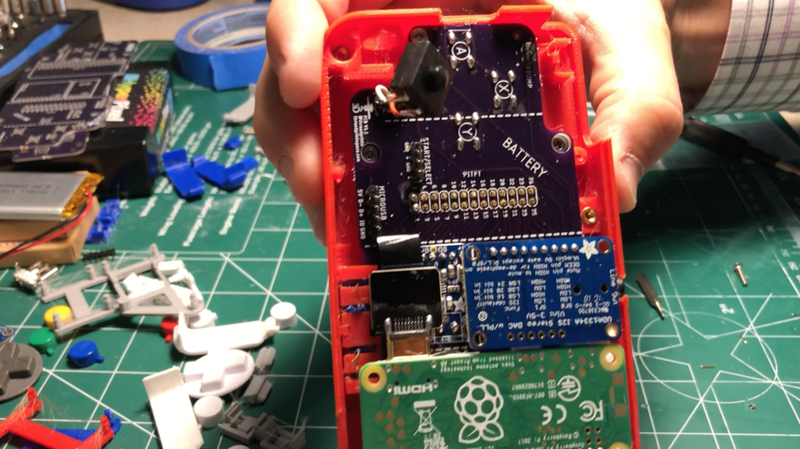 You'll want to make sure you have a tight fit between the PiTFT and the PCB as the looser this is, the harder it will be to get the whole case to fit. I'll have some variable depth back cases so you can print a deeper one if you need to get the case to fit better later. Go ahead and solder the PCB to the PiTFT!